Stonyfield Yogurt Pearls + Cafe ArtScience! This post is sponsored by the kind folks at Stonyfield. I’m a nerd at heart and I love anything related to food + science. I studied chemistry in college, and I seriously would have considered a career in food science had MIT offered such a program. I actually have a good friend whose twin actually did study food science at Cornell. Anyway, even though my academic training took me more in the biotech/pharmaceutical area, I still have always had a passion for science, more specifically chemistry, and how it relates to food. 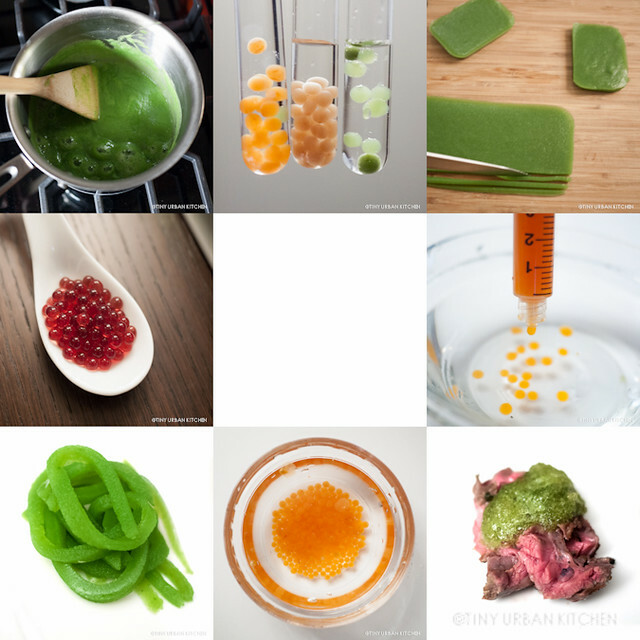 You can see this all over my blog, from my forays into molecular gastronomy to the “nerdy science lesson” at the end of my spring pea soup recipe explaining how acid helps preserve that gorgeously bright green color. This is why I was so excited when Cafe ArtScience and Le Laboratoire opened in Cambridge. Le Laboratoire, originally from Paris, is the brainchild of biomedical engineer and Harvard professor David Edwards. Le Laboratoire is a think tank for food innovations. David Edwards has invented numerous wacky inventions there, such as Le Whif (inhalable chocolate), the oPhone (a device that can send aromas), and the wikicell, an edible, washable skin (“like a grape”) developed as a technology that could reduce the amount of disposable food packaging used today. Their first commercial product using this wikicell technology is called the WikiPearl. The inside is ice cream or frozen yogurt, and the outside is the edible skin. The skin is an “electrostatic gel” made from a food particle, calcium or magnesium ions, and a polysaccharide (e.g., alginate). Although the ingredients sound like the ones that are used in spherification, David Edwards told me that their proprietary technique makes the skins much more stable and long-lasting than the spheres made using traditional spherification methods. According to Professor Edwards, 95% of the skin is the food particle – you don’t need much of the ions or polysaccharide to bind it together. For example, pictured above is a Wikipearl with chocolate inside and coconut on the outside. I can attest that the outside really tastes like coconut. The flavors are very natural and clean tasting. The inside is chocolate yogurt, which together make a lovely combination. The texture reminds me of coconut too, which makes sense, since 95% of it is coconut. Before I thought these WikiPearls were only available at Cafe ArtScience. However, David Edwards and his team have partnered with Stonyfield to actually bring the WikiPearl to the supermarket. Called Stonyfield Yogurt Pearls, these WikiPearls consist of Stonyfield frozen yogurt housed in a variety of different casings. The edible skins eliminate the need for bowls or spoons. They also protect the ice cream from the heat and allow it to stay cold longer outside the freezer (like maybe in an ice bucket during a party!). The skin doesn’t melt or get your hands dirty. Furthermore, it can be made from almost any food particle. I had a chance to try some of these Stonyfield Yogurt Pearls. My favorite was the coconut (shell) + chocolate (inside), though they are all very tasty. What I liked best is how natural the “skin” tasted. I almost believed I was eating a coconut shell. The fruit flavored “skins” also tasted quite natural. I appreciate how Stonyfield is trying to be more environmentally conscious by packaging these pearls in 100% renewable sugarcane cartons. I guess it’s still hard to completely get rid of all packaging. Just this past week I had the opportunity to visit Cafe ArtScience and actually meet David Edwards in person. The man is most certainly really passionate about his work. His hope is to continue researching different ways to address this problem of packaging waste. He said they were looking into ways to replace the ubiquitious plastic water bottle, among many, many other ideas. They started with an ice cream product because they thought that psychologically, it would be easier for people to adopt. But the possibilities for applications are endless. These skins can be microwaved, they can be washed, and they can hold hot liquids too. Can you imagine, maybe a Chinese soup dumpling in a WikiCell?! Even just bringing your soup to work inside WikiPearls is an interesting idea. No more bowls! Just pop a WikiPearl for every spoonful. Again, some of these ideas require changes in people’s perceptions in how they eat certain foods. At the event they showed us different holders for WikiPearls, like the interesting pieces in the photos above. Todd Maul, co-founder and “cocktail guy” at Cafe ArtScience, served a fantastic cocktail he had designed in honor of the WikiPearls, called the Pearl Jam. It contains guava puree which has been centrifuged and then combined with cranberry, vodka, lime juice, and a host of other ingredients I can’t quite remember. This is rare, but I didn’t think it was too sweet (which happens far too often with me and cocktails). It’s fantastic and I’m pretty sure it’s currently on the Cafe ArtScience menu. Cafe ArtScience provided a gorgeous spread of food. It reminds me that I really need to come back here for a meal again, after my first excellent dinner here. We all went home with a box of Stonyfield Yogurt Pearls to try ourselves. I really like them, especially the coconut one because it’s less sweet than the fruit covered ones. You can get these at any Whole Foods in New England now. If you want to try some, here’s a coupon for $2 off of a two-pack. Disclaimer: this post was sponsored by Stonyfield. I did not pay to attend the event at Cafe ArtScience, and I received free samples of Stonyfield Yogurt Pearls. All opinions are my own. « Taste of South End THIS TUESDAY + Giveaway for 2 tickets!